As academics begin to increase with this age group, I try to educate parents on how beneficial reading can be for their children over the break. During IEP meetings, I generally begin discussing how I incorporate story elements, vocabulary, retell, etc. into therapy so they can do the same at home. I have the parents tell me about their children’s favorite book at home and provide a quick synopsis on how they, too, can be an SLP! Other ideas I offer include having their children help plan trips to the beach, zoo, pool, or any other outdoor activity. They can work on comparing and contrasting, predictions, recalling details, sequencing, or even find things that have their target speech sound. With this age group, I usually advocate for more independence on the student’s part. I encourage parents and students to keep a journal to incorporate written language skills; help plan more complex tasks or trips; maintain their own schedule by keeping an agenda with their activities; or developing their own board games with written rules. Parents can even help their children develop more complex sequential skills, as well as independence, by having them help with the grocery list and cooking/baking, all while describing, planning, organizing, comparing and contrasting. I also encourage parents to read comics with their children to promote pragmatic language skills, including perspective-taking, figurative language, and social problem-solving. 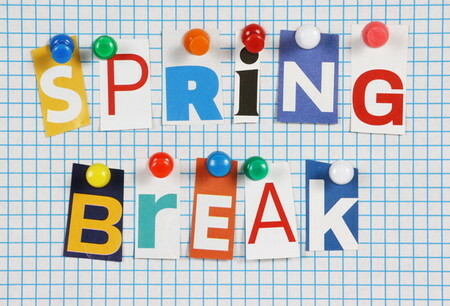 I strongly believe that students should be able to enjoy their spring break the same way we do – with zero paperwork and more unstructured time. Although many students are opposed to any sort of homework, with our help these activities can be fun and occur naturally within the home environment, further educating parents on how important their interactions can be with their children when using some creativity and increasing awareness of learning opportunities.